Many memories shared about food happens in the kitchen, which makes it the heart of the home. My earliest ones are centered around my grandmother and my aunts who have their own specialties. Nanay used to cook a lot of Filipino and Spanish dishes such as sinigang, pinakbet, kare-kare and paella in our 'dirty' kitchen. One of my aunts whips up a mean lasagna, bread pudding and leche flan while the other likes making kaldereta and maja blanca. Ah, the delicious sights, smell and sounds! These days I would take over the kitchen to prepare simple meals or assist Nanay to learn new ones. To me, having the right equipment is as important as picking the freshest ingredients and knowing the recipes. So today I want to share with you my trusted cookware and tools. 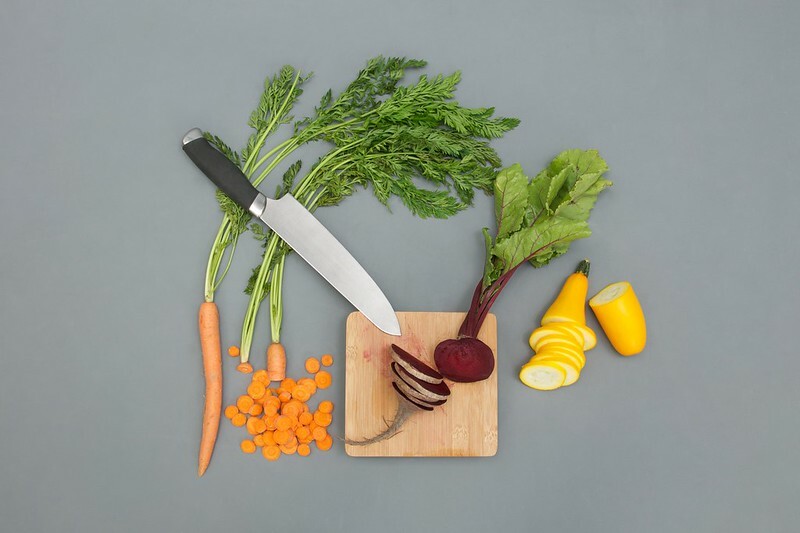 Cut poultry, seafood, veggies, fruits, and herbs with a sharp knife. You only need one with a gently curved blade and molded plastic handle that you can safely and comfortably use with wet or greasy hands. And as a good food safety practice, prepare your ingredients on separate cutting boards to avoid cross-contamination. Wood or plastic, it should be large enough to hold ingredients so you can add them directly onto the pan. Nanay cannot stand in front of the gas stove for long periods of time anymore so we put our induction cooktop to use. It takes less time to cook because the pan heats up quicker, no need to worry about gas leaks or open fire, and quick to clean up. Hidden in our cupboards are a variety of aluminum pans – each for a specific purpose. They're not meant for induction cookers though. Recently I got #LockedinLove with this good-sized non-stick wok with lid from Lock & Lock that fits our cooking needs. You should look for ones with a sturdy handle, easy to clean and scratch-resistant. My mom and my brother have a thing with baking but we don't own an oven so we experiment with mug cakes with a microwave oven. It's also handy for quick mug breakfasts, reheating leftovers and making popcorn! What are your top kitchen must-haves? Share with me in the comments section. Happy cooking! P.S. : The pan I used was a Lock & Lock Stone Wok. Follow Lock & Lock on Facebook (https://www.facebook.com/LocknLockPhilippines). In case you want to invest on quality pans, pick yours in one of Lock & Lock's Boutique Stores at Shangri-la Plaza Mall, Eastwood Mall, Glorietta 4, BF Homes, Alabang, Fisher Mall, Quezon Avenue, and Fairview Terraces or leading department stores nationwide.